LOS ANGELES — With National Hockey League teams opening rookie camps this week, and with training camps opening next week, the 2013-14 NHL season is just about upon us, and our focus will, of course, quickly turn to the teams and their players. But before Frozen Royalty begins its coverage of the 2013-14 Los Angeles Kings, starting with Friday’s media day during their Rookie Camp (players are expected to be on the ice at 10:00 AM today at the Toyota Sports Center in El Segundo, California), there is one bit of news left from their 2011-12 Stanley Cup Championship to catch up on. 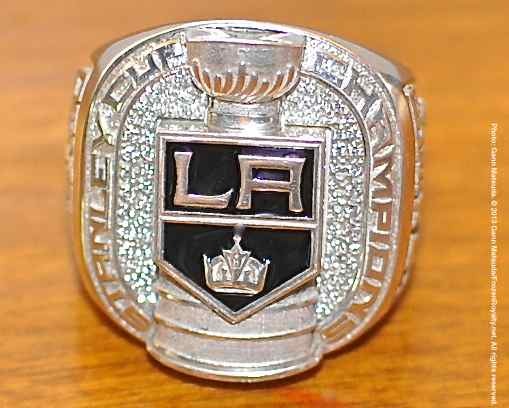 As many are aware, former Kings greats Marcel Dionne and Rogie Vachon each received a Stanley Cup ring from the team during the opening day festivities on January 19, 2013, at Staples Center. 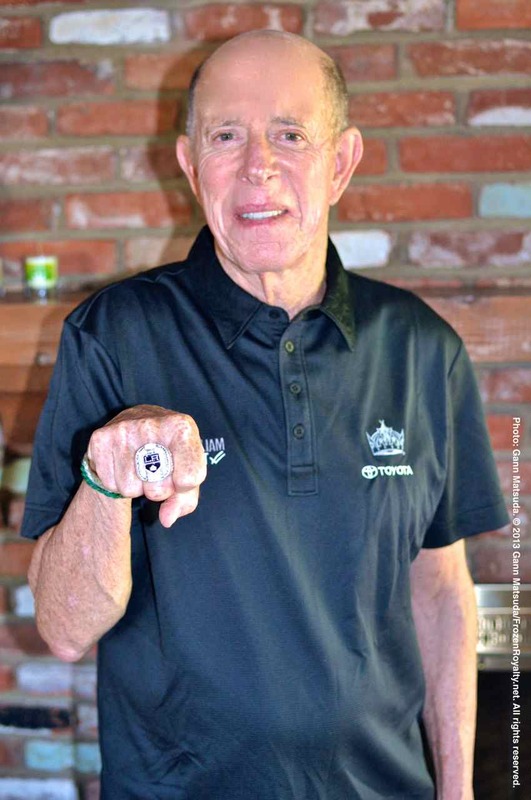 Another Kings alumnus had to wait just a bit longer for his Stanley Cup ring, one who worked 2,632 consecutive games over 34 seasons with the Kings (37 years with the franchise), and was as deserving as anyone. That Kings alumnus is none other than retired head athletic trainer Pete Demers, who got his start with the Kings organization back in 1971, when he became the head athletic trainer for the Springfield Kings of the American Hockey League, which was the Kings’ AHL affiliate, at the time. Last week, his Stanley Cup ring finally arrived, just a bit later than anyone hoped. Demers spends his summers in Nova Scotia. As they were for Dionne and Vachon, Kings President/Business Operations Luc Robitaille, and now-former Kings Governor and Chief Executive Officer, Anschutz Entertainment Group Tim Leiweke were behind the move to get a Stanley Cup ring for Demers. Seeing the 2011-12 Kings win the Stanley Cup had Demers overflowing with pride. After the on-ice celebration once they had won the Stanley Cup on June 11, 2012, the celebration moved into the Kings dressing room, a private affair for the players, coaches, and selected team staff. But a few others were invited, including Demers. 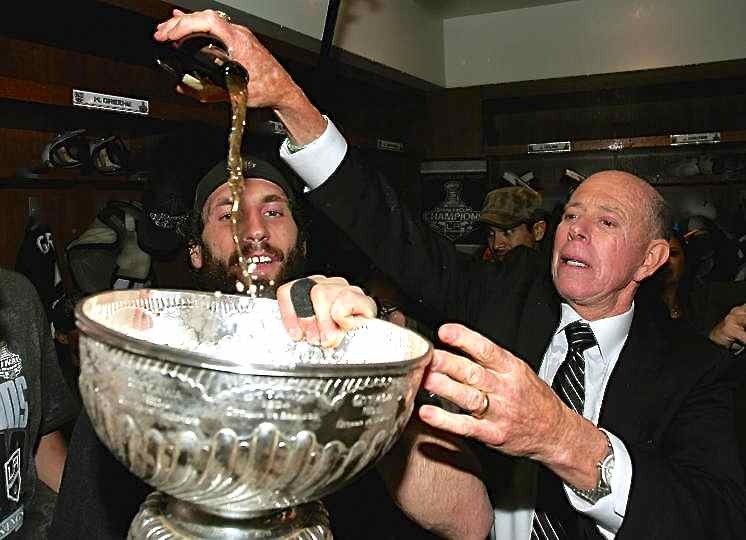 Demers pours the beer he saved from the 1993 Stanley Cup Final into the Stanley Cup, with Jarret Stoll looking on. Demers had a bottle of Budweiser beer that he had saved from the Kings’ 1993 Stanley Cup Final, one that he vowed not to open until the Kings won the Stanley Cup. 19 years later, during the locker room celebration, Demers finally got his chance to open that bottle and pour it into the Stanley Cup. Demers was humbled and honored. Demers never thought that the Kings would fail to win the Stanley Cup while he was working. Kings defenseman Jerry Korab; Calder Cup (AHL Championship) 1971. Indeed, Demers continues to play an active role with the Kings, and they have kept him involved. Although Demers has only been back home in Los Angeles for a little over 24 hours, as of this writing, you can bet he will be showing off his new jewelry to his friends, family, and probably anyone else, for that matter, as soon as he gets the chance. “I’m going to wear this ring with pride,” he said. Given the strong sense of pride that Demers displayed throughout his Hall of Fame career with the Kings, that should come as no surprise whatsoever. Stick tap to photographer David Sheehan (@calishooterone on Twitter) for his contributions to this story. I remember as a kid, that at the end of the 71-72 season, Pete Demers was voted the unsung hero of the team that year. I remember it due to the lengthy intro given about him and thinking to myself that the amount of time and dedication mentioned didn’t fit any King player I knew. lol. Well deserved Pete.